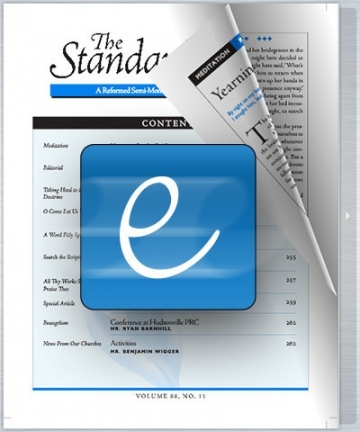 We’re excited to now offer an eSubscription to the Standard Bearer, a great new product serving those who prefer digital media. Those who eSubscribe to the Standard Bearer are given access to the latest issues of the Standard Bearer right at our website. No more waiting for it to come in the mail! No more wondering what to do with those stacks of old issues! The latest issues of the Standard Bearer are available in PDF, eBook, and FlippingBook (a neat digital magazine format), giving you multiple viewing options. Purchase an eSubscription now for just $21/year (both US and international subscribers) and any current hardcopy subscriber pays only $10.50 for an eSubscription! The Standard Bearer Archive Has Been Updated! The Standard Bearer archive has a great new modern look and improved search functionality. Some new features include: user-friendly keyword search, keyword highlights within the search results, and search by Bible Text. You also have the option to view recent issues as a PDF or FlippingBook (a neat digital magazine format). Soon you will even have the option to download individual issues to your eReaders! « Is evolusie in pas met ons Christelike oortuiging ?